Take a full 90 days after you receive your order to decide is ViSalus/Body By Vi right for you. 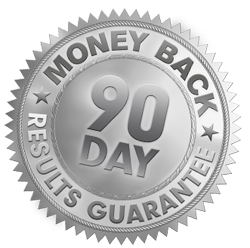 If at the end of 30 days you are not completely satisfied, just return the unused portion of your product for a full refund. at (877) VISALUS within 10 days of completing your Challenge. orders. Maximum refund of 3 auto-shipped Challenge Kits per person. Promoter exercises the guarantee, they will forfeit their Promotership. like to request your refund. Qualifi cation criteria are subject to change. *Program Rules: Available to new Customers & Promoters who enrolled after January 1, 2013, and is limited to an individual’s first 90 days of Challenge Kit orders. if you would like to request your refund. Qualification criteria are subject to change. Please visit guarantee.vi.com for complete details. We will not refund or accept return packages unless you have requested for an RMA number in advance. A Return Pre-Authorization Number is necessary for a return to be processed. The Customer is required to contact us to obtain a Pre-Authorization Number. This number must be written on the Refund Authorization Form that is to be sent back to us with the returned product in order for the return to be processed. If a package is returned without a Return Pre-Authorization Number, the information will be documented and the Customer will be required to call and provide further information as to why the package was returned. Exchanges for the same product will be made for products that may have been damaged in transit. Products which have been purchased for the first time and don’t meet our customer’s satisfaction can be returned within 30 days of delivery for a full refund less shipping and handling. Please allow up to 30 days, or two billing cycles, from the date of request for the Billing Department to process your refund. Shipping charges will NOT be refunded for orders that have left our warehouse. Please note: If you are currently a Customer, Promoter or Distributor with ViSalus Sciences®, or if you have an ID number, you will need to contact ViSalus Sciences® directly @ 1-877-847-2587 (Toll Free) or via email: info@visalus.com. ViSalus is currently experiencing unusually long hold times due to increased demand. Please be patient, or contact them via email. Email response time from ViSalus is currently 24-72 hours. Returns of all other product must be made within 30 days of delivery of product orders in order to receive a refund for the value of the saleable product returned. Returns of all salable products made more than 30 days from the delivery date will be eligible for product credit towards other ViSalus products and are subject to a 10% restocking fee. incorrect or incomplete address) may be subject to additional shipping and handling charges to have the product resent. refund will be deducted from future Commission payments.